My First Quilt Magazine Cover!! I am so excited to present my first magazine submission….and it made the cover!! I was trying to come up with a very small pineapple block to work into a cover for my sketchbook. 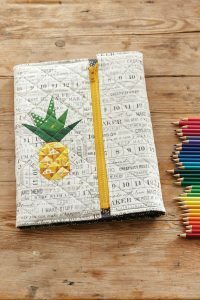 I had already worked out a pattern for a larger pineapple block (11 in x 7 in) but I wanted one that would be small enough to fit within the cover of a sketchbook. So I reworked the pattern and stitched out a sample. Perfect. Then, I began to work on a pattern for the sketchbook cover. I wanted something that would close with a zipper, but, wanted to use up my separating zippers. And the quilted sketchbook jacket was born. I was super happy with the prototype and wanted to get some exposure for the pattern. 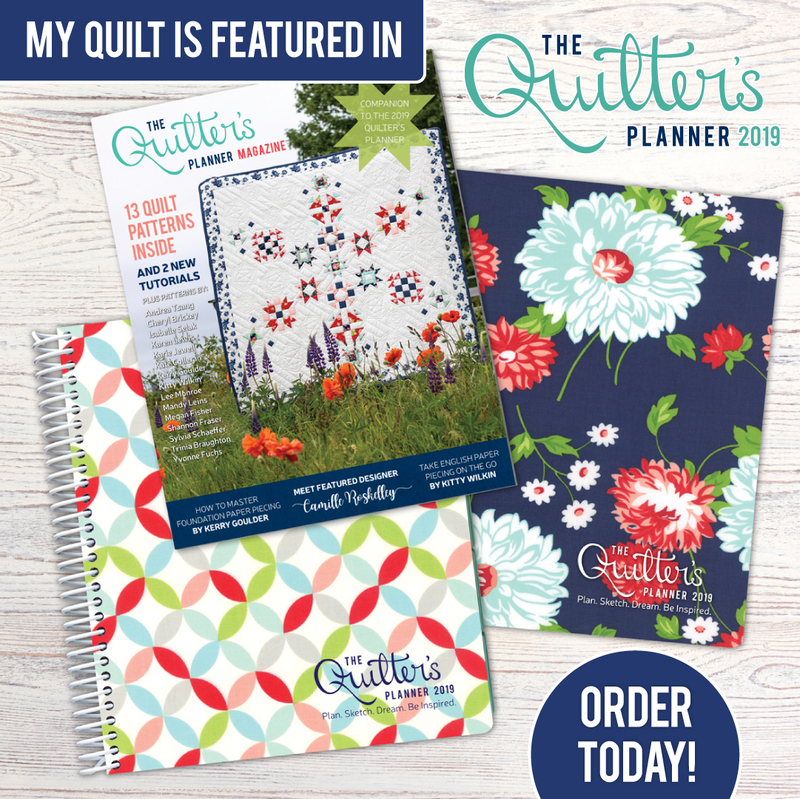 I have a pattern on Craftsy, and while it is a great venue for selling indie designer patterns, I don’t know how to get more exposure for it and really wanted this pattern to get more exposure. So, I went about researching magazine submissions. 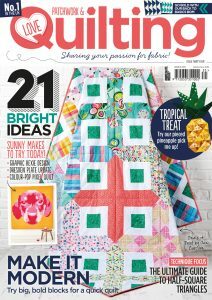 I absolutely adore Love Patchwork & Quilting Magazine out of the UK. My subscription started in 2014 and I love all the content the magazine brings. While I wish the delivery was much quicker….good things come to those who wait, right? I wanted to see if LP&Q would be interested in my pattern. The email was written about 10 days before I even sent it off…as I debated whether my submission would even be seen let alone accepted. It is a big step to take sending your ideas off to an editor and submit to the aesthetic of someone far off you have never met. But, I took the plunge and clicked the Send Button on the email with images attached. To my utter astonishment and delight the reply to my email was prompt and my submission accepted! I was pinching myself for days! Then, the real work began because I now had a deadline…a real deadline! The deadline was met and my samples were sent off….and LP&Q worked their magic on the magazine layout! Oh and those images are magic!! Thank you for a great experience Love Patchwork & Quilting!! The magazine was released May 25th, and will be available in the US in 2-4 weeks. Bookstores & Quilt Shops carry single issues, and you can get this beautiful magazine delivered to your door or your mobile device. Visit the Love Patchwork & Quilting website to find out how!! I have created a mod for the pattern to add a zipper pocket to the inside cover. The pocket will be perfect for holding pens & pencils while you travel with your sketchbook. Look for the post within the next week. When you make a quilted sketchbook cover, please take a picture and tag @penguinfeats on Instagram or Penguin Feats on Facebook. I found your pattern in the magazine and started to put it together. I was wondering if you have more pictures to help with the construction? I am totally lost in the zipper steps 11-13. I really love the zipper approach and the pineapple, but after all that piecing I don’t want to mess it up! Thank you Jennifer…I don’t want you to mess up all your work too! If you have already stitched the slider side of the zipper, you do the same thing for the non-slider side of the zipper with the opposite edge of the sketchbook lining & exterior. You can see in Fig E the way all layers are pressed away from the zipper. Fig C shows approximately where the slider side of the zipper should be aligned so the pineapple is not bent over the spine of your sketchbook. You will need to align the zipper so your pineapple sits entirely on the cover to the left of the zipper. I hope this helps. I am working on a modification to the pattern to add a zipper pocket for pens & pencils. Hopefully I can include some pics that will show the zippers in more detail. It should be on the blog in the next few days.